We do our rounds and so does your message! A door-to-door leaflet still has a crucial role to play in the purchasing process and is therefore absolutely indispensable in your media plan. You yourself decide on its target reach – countrywide or segmented – and we take care of an efficient distribution. Integrate your promotional action and logo countrywide on the strikingly visible strip on the front and back of the leaflet package. This way your message will catch the eye as soon as the letter box is opened. Do you have problems finding the right man or woman for the job because the profiles you are looking for are scarce on the labour market? With Jobdrop you can distribute your vacancies via an attractive recruiting leaflet that is distributed door-to-door. From car sales to travel – widen your campaign’s reach and impact. 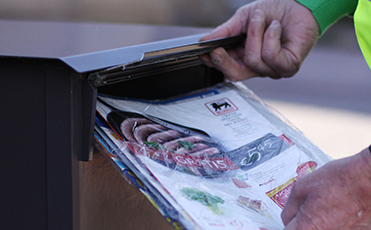 Have your information leaflet delivered separately from commercial mail. While you take care of your voters, we take care of the national or regional distribution of your election print matter. Have your leaflets and discount vouchers distributed tailor-made for your region. Decide yourself where and when your printed matter will reach the desired target group. Thanks to a door-to-door recruiting campaign, AS Adventure found exacty the right employees for it's new branch. 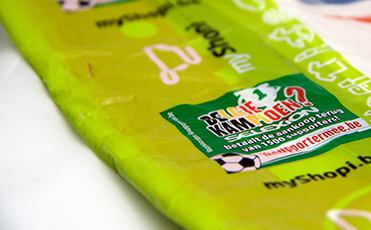 Selexion had the BD myShopi seal package customized in order to promote her cashback action for soccer fanantics during the World Championships.